As Tribal Clash grows in scale and popularity it has become necessary to make some format changes. These changes will come into effect in our European events in 2019 and we firmly believe they will improve the competition not detract from it. As you will learn below Tribal Clash will become both more inclusive and safer while at the same time becoming more challenging and exciting. This article is intended to explain the changes, the reasons behind them, what they mean to you, and why you shouldn’t fear them! First of all it is important to explain where Tribal Clash is going. Tribal Clash is evolving into a world series. In 2019 we launch new events in Australia and USA and by 2020 there will be several events dispersed around the globe on some of the world’s most iconic beaches. Eventually there will be a global series final for the best teams from each of the regional events. This global final will be an exclusive event for a small number of the world’s strongest teams. It will be set in an top secret exotic location, and athletes will be tested across an extraordinary range of previously unimagined events. The aim is to discover the World’s Strongest Team and in order to do that effectively we need to set the rest of the competition up just right. Traditionally teams have taken part in six separate events across the weekend. Four on Saturday and then another two on Sunday. The highest placing twenty four teams progressed to a semi final during which half were eliminated. The remaining 12 teams made it through to the final. The new format will see all teams taking part in a minimum of four events after which some of the field will be eliminated. For most of the Sunday, the events will be elimination events until the field has been whittled down to just twelve teams for the final. All of the Day one events will be programmed along traditional Tribal Clash lines and will be challenging but inclusive. Sunday will become increasingly harder and heavier, with fewer or no scaling options. For many teams the measure of success will be just how far they manage to progress through the competition. Those teams are cut after four events will be leaving the competition at the right stage for them. More on that later…. MAKING THE COMPETITION MORE COMPETITIVE: Tribal Clash was conceived as a concept to offer competitive athletes the very best possible experience. In other words we set out to design and curate the ultimate good time for people who love to compete. If you are a competitive athlete then you will know that the kind of events that simply present a fun challenge without winners or losers like Tough Mudder for example have limited appeal to you. Yes it can be fun to do an obstacle race every now and then but that’s all that experience will ever be – fun. True competitors like to try to win, and they aren’t afraid of loosing either. If there in nothing to loose then there isn’t much to gain. It’s the The agony and ectasy of competition that we are all addicted to and keeps us coming back time and again. True competitors either win or they learn, and if they don’t win then they are inspired to train harder and come back better. Tribal Clash is like crack for athletes. And in order for us to make our crack even better we need to make the competition even more competitive. MAKING THE COMPETITION SAFER: Another really important way we can improve the competition is to make it safer. We want as few injuries and casualties as possible. If our aim is to give you the best possible athletic experience and you end up injuring yourself or worse then we have utterly failed in that aim. The best way that we can ensure athlete safety is to make sure that we programme events that are appropriate to the strength and fitness levels of the athletes competing. As Tribal Clash has increased in popularity over the last six years we have observed an interesting phenomenon. The standard at the top of the field gets better and better with each edition of the competition. We are aware of more and more teams are making Tribal Clash their specific focus (Endurance athletes would refer to it as their ‘A Race’) and training year round for the competition. This is great and is an affirmation of the direction in which the competition is going. BUT in parallel with this we have also noticed a gradual increase in the number of athletes taking part who DON’T meet the published minimum standards. In other words the spread between the best performing teams and the worst performing teams is getting bigger and bigger. As a result it is getting more and more difficult for us to program events that properly challenge the stronger teams whilst at the same time keeping them achievable and safe for the weaker teams. We want to welcome all teams from all backgrounds to Tribal Clash, so this is a big dilemma to solve. At Tribal Clash UK 2018 for example, we had published in advance that there would be a requirement for all athletes to complete an open water swim. The swim, whilst longer than listed in our published minimum athlete standards, was as safe as a swim can be: the athletes swam with incoming tide, in flat calm water, surrounded by lifeguards and with paramedics at the exit point. Despite the advance announcement, and our published minimum standard, a significant number of athletes started Event 1 who could not swim at all and many others who we would class as weak swimmers. As a result, we had several extractions from the water and one extremely serious incident which resulted in the athlete (a non-swimmer) being taken to hospital. Only because we take safety seriously, because we had put in appropriate safety measures, and because our paramedics got to the athlete quickly, the incident had a good outcome. After lengthy discussions here at Tribal HQ, deliberating whether we should not program open water swimming at all, we came to the conclusion that it would be a shame to water down (excuse the pun!) the programming for the majority of the teams but that we absolutely must ensure all athletes can compete safely and effectively. In other words, in order to keep challenging ALL athletes in a way that is appropriate to their level we need a format that eliminates teams before they get to an event that they are unable to take part in safely. Movements such as rope climbs, or heavy atlas stone lifts, are another example. Attempting these for the first time in a competition, without having trained with them or having the necessary base level of fitness, is an injury waiting to happen. We want to offer as many teams as possible the opportunity to experience the thrill that is competing at Tribal Clash, at a level that is safe. With the changes that we are introducing, we may, for example, exclude the heaviest stones from the first four events. Or, if rope climbs are programmed, not everyone in the team has to complete one. Through the elimination rounds, scaling options will disappear as the competition becomes about test of finding the most capable teams without any weaknesses. ALLOWING A GREATER NUMBER OF TEAMS TO TAKE PART: Importantly the proposed format changes allow MORE teams to take part in the competition. Previously – from an organisational stand point – the maximum number of teams we could cope with at any event was 160, The ideal number being around 120. Now we will be accepting registrations from up to 216 teams per event. Thus allowing an additional 56-96 teams to get involved. Why is this a good thing? Well quite simply, more teams equals a more competitive field. If the ultimate aim is to discover the world’s strongest team then we need to cast the net as widely as possible. The more teams are involved the more meaningful your results. If you are a true competitor then these changes will excite you and inspire you to train even harder. If you are a first time Tribal Clasher then these changes will now make the competition more accessible to you and you can relax knowing that you won’t be asked to do anything beyond the level that is appropriate to you and your team. If your team does get eliminated after four events then you will know where you stand and can come back with renewed vigour the following year. And don’t think for a second that you won’t want to stay around and watch what happens to the other teams on Sunday. This will be one show you want to stick around for. Be prepared to inspired. Tribal Clash is constantly evolving. 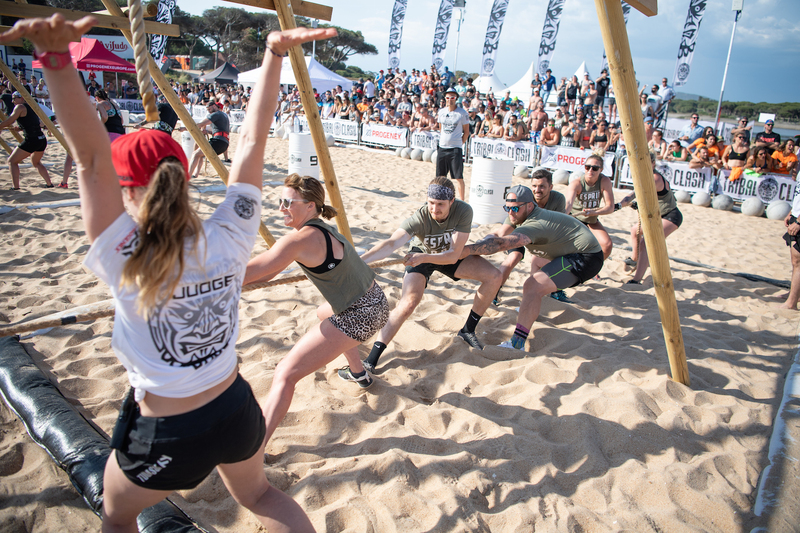 Although it is a fun weekend on the beach with an epic party at the end, it is ultimately a competition, a test of fitness and capability for any brave teams who are prepared to put themselves on the line. Just getting to the start line of Event 1 with a team of 6 athletes prepared to suffer through at least 4 events, is an achievement in itself.